Rebels in a remote northern region of Ethiopia have blamed government forces for the deaths of five European tourists in a clash last week. The Afar Revolutionary Democratic Unity Front (ARDUF) said the deaths occurred when Ethiopian troops fired on a rebel unit which had kidnapped the visitors. Two Germans kidnapped by the group are "in good health", the rebel said in a statement on opposition websites. Ethiopia blames neighbouring Eritrea for backing the rebels. The clash happened on 17 January in the Afar region near the border with Eritrea. Two Germans, two Hungarians and an Austrian national were killed in the incident. The rebels - who are fighting for greater autonomy - said in their statement that they killed 16 Ethiopian soldiers and wounded a dozen. Ethiopia has not acknowledged losing any troops. 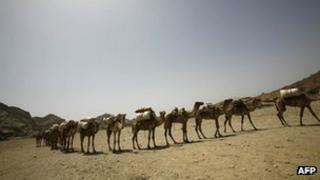 The tourists are believed to have been visiting an inhospitable volcanic region in Afar when the violence happened. An Ethiopian policeman and driver were abducted along with the two Germans. At least two other members of the tourist group were injured. The violence is the worst involving visitors to the region in recent years. Eritrea has strongly denied Ethiopia's accusation that it trained and armed the rebels. ARDUF seeks autonomy for the Afar people in both Ethiopia and Eritrea.